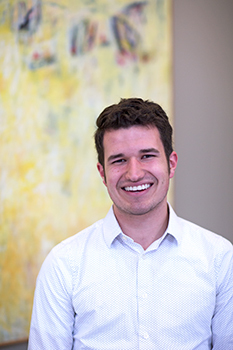 Wabash College senior Matt Hodges has been selected to attend the Clinton Global Initiative University (CGI U), a conference hosted by former President Bill Clinton. Approximately 1,200 students from 112 countries will be in attendance at the 11th annual event this weekend in Chicago and will collaborate with university representatives, celebrities, and topic experts to develop solutions to global problems. A math major who plans to attend medical school following graduation, Hodges has been involved with Wabash’s Global Health Initiative since his freshman year. He has spent the past two summers working in healthcare, first as a courier for a nursing service in rural Appalachia and then at the Montgomery County Health Department, where he accompanied inspectors to restaurants and public facilities and put his math skills to work analyzing data from the Community Health Needs Assessment. Hodges won admission to the CGI U conference by submitting a proposal to help eliminate some of the barriers Montgomery County residents face when trying to obtain proper healthcare – an idea that came from his time at the health department. 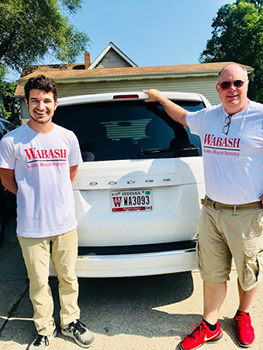 Hodges had an idea to use Wabash College vans to start this transportation service. In just a few months, they had a model laid out that was based off a shuttle service he had seen used during his time in Appalachia. Before submitting his proposal, Hodges interviewed local community leaders in healthcare and public policy. He also attended the community conversation about local transportation facilitated by Wabash’s Democracy and Public Discourse. The Clinton Global Initiative University conference will be held from Friday through Sunday at the University of Chicago. It was launched in 2007 to engage the next generation of student leaders from around the world.